It’s National Religious Freedom Day, in these United States. 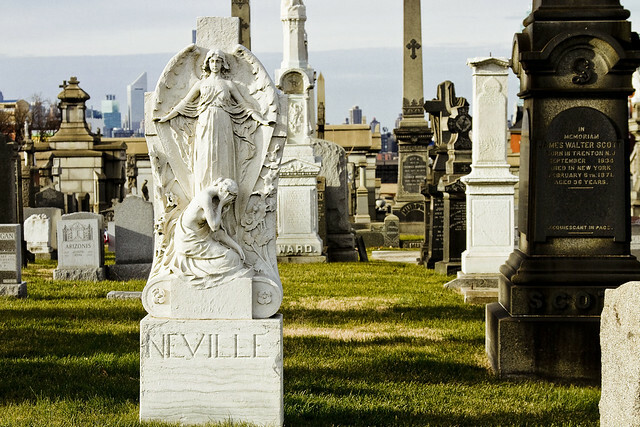 I’m often reminded of these fictional extraterrestrials while wandering through Calvary Cemetery in LIC. 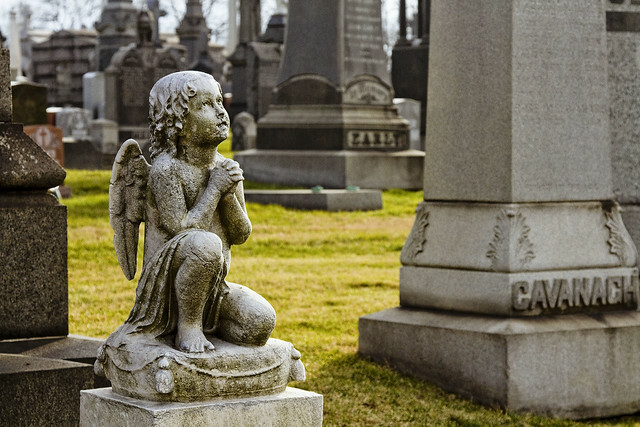 I mention the Weeping Angels, as it can often be quite a creepy experience solitarily waltzing through Calvary Cemetery. I’ll find myself fixated on a certain bit of statuary, focusing in on its details, as with the Neville monument pictured above. In my mind’s eye, the proverbial “other shoe” is about to drop at any second when the statue will turn its head and stare back at me. If they ever find me stone cold dead somewhere in Calvary, it will likely be the case that a statue reached out to me from its perch and a blood vessel in my head burst from the purest form of terror. It’s probably the life sized statues that are the creepiest ones. 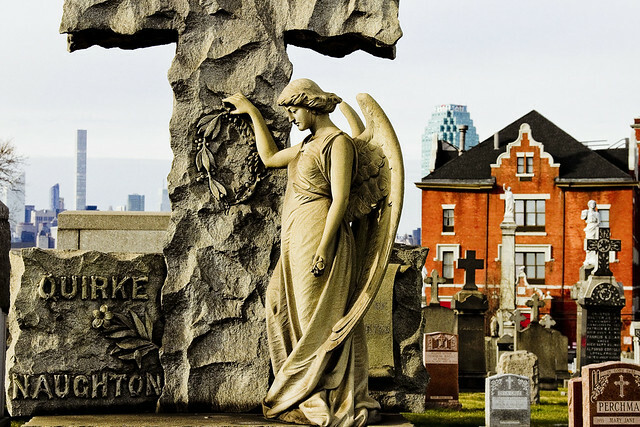 Covered in nitre and lichens, there’s a lot of true art on display in this – the principal burial ground of the Roman Catholic Church during the heroic age of 19th century New York City. Mortuary sculpture doesn’t get its due, unless it’s literally older than Croesus, in which case it’ll be found at the Metropolitan Museum or the Louvre. A truly striking bit of carving is found nearby the Greenpoint Avenue gates of the cemetery. The granite Quirke Naughton monument is stunning, and has survived the century it has stood here in fine fettle. 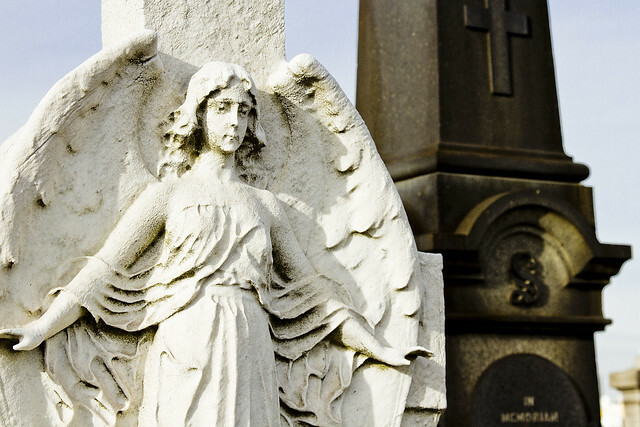 The angel adorning it is more than seven feet tall, and the cruciform has to be at least ten to fifteen feet in height. Were this one of Doctor Who’s Weeping Angels – which might sweep a humble narrator up into its otherworldly embrace – only that inhuman thing which cannot possibly exist but nevertheless inhabits the sapphire megalith of Long Island City, and which contemptuously stares down upon the world of men with its three lobed burning eye, would know what became of me.